The Jenna dresser features a charming design with delicate accents. Keep your little one organized with its 4 large drawers, perfect for storing clothes and 3 smaller drawers, ideal for more delicate items. Arched cabriole feet and crystal-like knobs accent this piece while a delicately arched mirror complete this piece. 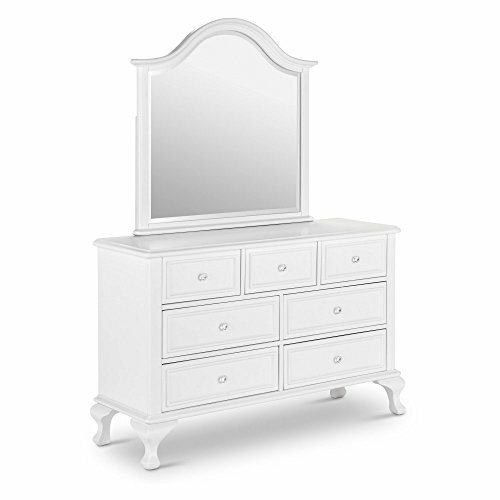 Features: Finish: White; Material: Solid Wood; Plywood; Partical Board w. Gumtree Veneer; Engineered Wood; Pine Wood; Crystal-like, acrylic knobs; Seven drawers; Arched cabriole feet; Arched mirror. Specifications: Overall Product Dimensions: 72" H x 53" W x 17" D; Overall Product Weight: 60 lbs. If you have any questions about this product by Elements, contact us by completing and submitting the form below. If you are looking for a specif part number, please include it with your message.